In a Week 4 that saw two new quarterbacks (Zach Mettenberger and Aaron Murray) propel their teams (Memphis and Atlanta) to their respective franchise’s first win, there’s really only one thing that is certain in the AAF – Orlando is better than everyone else. The Birmingham Iron fell at home to San Antonio, who lost the previous week to San Diego, who handed the Express their aforementioned first win the following week. A mostly-healthy Arizona Hotshots squad, still second in this rating system, lost to an Atlanta team that hadn’t even covered through the season’s first three weeks, let alone won. Alas, we continue to try to handicap the upstart league. A lot of what goes into this algorithm is the preseason odds to win the AAF (via MyBookie.ag), but the results of the first four games for each team are weighed in considerably. We cannot promise that the inputs today will be the same inputs later in the season, given the nature of having only 16 games to go off, but we will be transparent about our process as always. Please tweet at @PFF_Eric and @BenjaminBrown22 if you have any questions about this ranking today or moving forward. While we’re likely a few weeks away from having a definitive guide to giving out picks for the AAF, there have been some notable outcomes market-wise through four weeks. First, favorites are 12-4 straight up and 9-7 against the spread. Unders (even though totals moved down almost two touchdowns from Week 1 to Week 4) are 12-4, going 3-1 each week of the inaugural AAF season. If there are some soft numbers going into Week 5, there will be an article highlighting such opportunities. 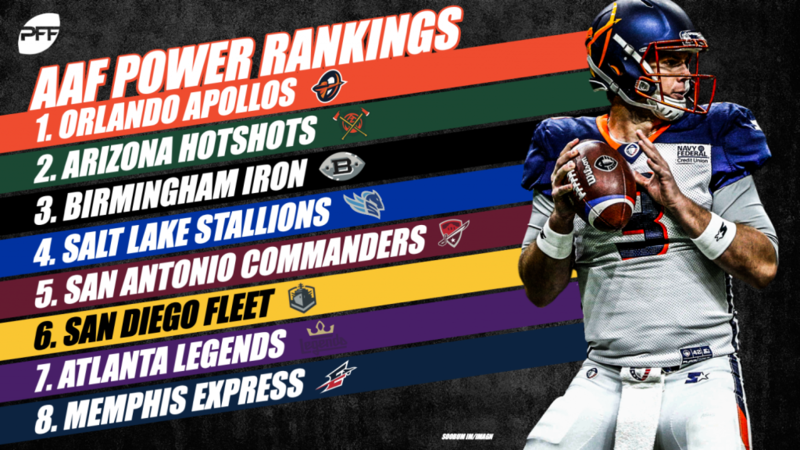 The Apollos continue to make quick work of the AAF, winning and covering against a Salt Lake team that took down their biggest competition for the one spot just a week earlier. There’s a pretty compelling case to be made for wide receiver Charles Johnson as the league’s most-impressive player through the season’s first four weeks, as he traded in his traditional deep ball Saturday for an 88.3 receiving grade that he generated on nine catches for 105 yards. While contested catches were a big issue for him in the NFL, he appears to be able to get open both over the top and underneath in the AAF, and thus far, he’s turned almost three-fourths of his resulting targets into catches through the league’s first four weeks. Reflecting the parity that exists in the AAF, the Hotshots lost for a second straight week, this time as 14 point favorites at home. John Wolford graded adequately, but the team just could not keep drives alive and went 4-of-11 on third downs. Wolford still holds the highest passer rating from a clean pocket and has only struggled when pressured, which is something that has happened on 33% of dropbacks so far. Defensively, the Hotshots haven’t exactly been hot, at least when it comes to tackling. To date, they have 57 missed tackles which are by far the most in the AAF. Sterling Moore has stood out in the secondary though, grading in the top five among cornerbacks in both coverage and run defense. Taking a victory lap on the Iron feels a bit premature, but their undefeated start always felt fraudulent. Their passing offense is the second-worst in the AAF, and despite having a generational talent at the running back position, Trent Richardson’s game hasn’t exactly translated well to the AAF as he currently ranks last among qualifying running backs with only 2.4 yards per attempt. With 167 yards after contact at an average of 2.49 yards after contact per carry, the blame may not fall squarely on Richardson’s shoulders: again, running backs don’t matter, but the offensive line blocking up front definitely does. It is true that the Iron have graded out well defensively, but a team built on defense, grit and the running game typically doesn’t have lasting success. Birmingham has a showdown with Orlando at home this week, which will be a great test to see where the Iron fits among the best of the AAF. The Stallions have been this league’s most unlucky team, losing their quarterback in Week 1, losing via a special teams fumble return in Week 2, and playing the league’s best team in the snow in Week 4. Running back Brandon Oliver continues to be one of their bright spots offensively though, generating an 83.8 overall grade on the ground Saturday night, with 2.6 of his 4.2 yards per carry coming after contact, and with five first downs on 17 rushing attempts. If their defense continues to be a top-three unit in the league, they should be able to pick up enough wins in the second half of the season to be both viable and in position to surprise people. San Antonio squeaked out an upset victory on the road against Birmingham. Logan Woodside has slowly digressed from his early-season play and has been way worse than awful when under pressure. Thankfully, Woodside leads the AAF in percentage of dropbacks that used play action, which has been his only source of success to date. Derron Smith has been exceptional at safety for the Commanders, grading out as the second-best defensive player regardless of position. To pull off another upset on the road, San Antonio will have to continue generating pressure at the highest rate in the AAF. After consecutive wins followed their disappointing first game in San Antonio, the Fleet surrendered a two-touchdown lead in Memphis due in large part to an injury to quarterback Philip Nelson, who was averaging over nine yards per pass attempt and exactly nine yards per scramble before he went out. Reports are that he will miss at least a month, which put the 2-2 team in a tough position as they push to contend. After a big week in Week 3, Ja’Quan Gardner averaged less than one yard per rush attempt against the Express, and barely over 1.5 yards after contact per attempt. With the offense likely struggling moving forward, they’ll need to lean on their league-best pass rush (83.9 grade) if they want to win the next few games without Nelson. Atlanta got their first legendary win last week, upsetting the Hotshots as 14-point dogs. At this point in the AAF, no team should be anywhere close to a two-touchdown dog. Aaron Murray came on in relief of Matt Simms and actually had some success moving the football; he averaged 7.3 yards per attempt, and he was nearly perfect in the 10-20 yard passing range. Simms was the worst passing QB in the AAF, so the switch to Murray was more than justified, especially with the success the Legends have had in pass blocking. Atlanta also has to do something to solidify their pass defense, as they have by far the worst coverage grade in the AAF. Last Saturday against the Fleet, the Express won their first game at home, moving to 3-1 against the spread in the process. They overcame a ton of adversity, which included the punt return for a touchdown that they allowed to start the game. While Zach Mettenberger largely avoided mistakes, averaging 7.0 yards per pass attempt in the process, it was their defense led by Drew Jackson (96.4), Corey Vereen (94.4) and Montori Hughes (90.1) that was the catalyst for them, slamming the door shut on San Diego by allowing only three points and forcing multiple turnovers in the second half.